You guys! These pancakes are too good. I love a good pancake breakfast but I just don't feel my best the rest of the day unless my breakfast has a good punch of protein, fiber and some healthy fats. 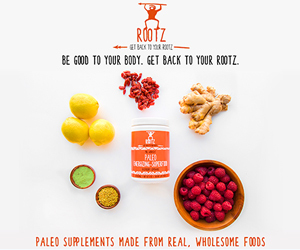 I recently became an ambassador for Rootz Nutrition (you can read more about why I love them at the bottom of this post!) and I've seen some realllllly yummy Rootz recipes and wanted to create my own. You'll see I kept the ingredients for the pancakes really lean and I did this on purpose because I would ALWAYS rather add in my fats with fun toppings than use them all up in the recipe itself (looking at you, almond butter)! Enjoy! Disclaimer: this post contains affiliate links. If you decide to purchase a product through these links you will also be supporting kaelyRD and that is MUCH appreciated!